When observing for the first time this bird we probably get the same feeling the first Europeans got when they met it in the Indian lands and noticed the strange shape of its beak. Perhaps, also Marco Polo wrote something about it in his “The travels of Marco Polo” but as we know, this character described many odd things and forgot just as easily many other very important and typical things of those so distant areas. The mist of the truth and the mystifications of the time, especially in the naturalistic world, lead us to believe also to the existence of dragons that burnt with their smelly and mephitic breath everything they met. It is however necessary to take note that this bird has really a fairly strange beak. The Asian openbill (Anastomus oscitans Boddaert, 1783) belongs to the order of the Ciconiiformes and to the family of the Ciconiidae. This Asian stork and the African openbill (Anastomus lamelligerus) are the only two birds sharing the characteristic of having a beak that for more than half of its length does not match between the two jaws, but the tip. A conformation that, seen in profile, allows a glimpse on an ample space between the two parts. This happens in the adult specimens as the juveniles have initially a normal beak although of a somewhat odd shape. Mistakable from afar and due to the colour of the adults during the nesting, with the Euro-Asian white stork (Ciconia ciconia) and the oriental one (Ciconia boyciana), is on the contrary unmistakable once its beak is sighted. Also in this instance the evolution has led to the conformation of this tool so much important in the birds, to bring it to the maximum functional capacity for the purpose it is expected. As it mainly nourishes of aquatic snails it seems that this shape facilitates the gripping, the handling and also the husking. There is no doubt that any name given to this bird, scientific as well as vulgar, has always referred to this unusual characteristic. The genus Anastomus comes from the Greek “anastomoo” = open mouth and the species oscitans from the Latin “oscitare” = to yawn, for the impression we get when its beak is seen. The European vulgar names follow the same tracks. 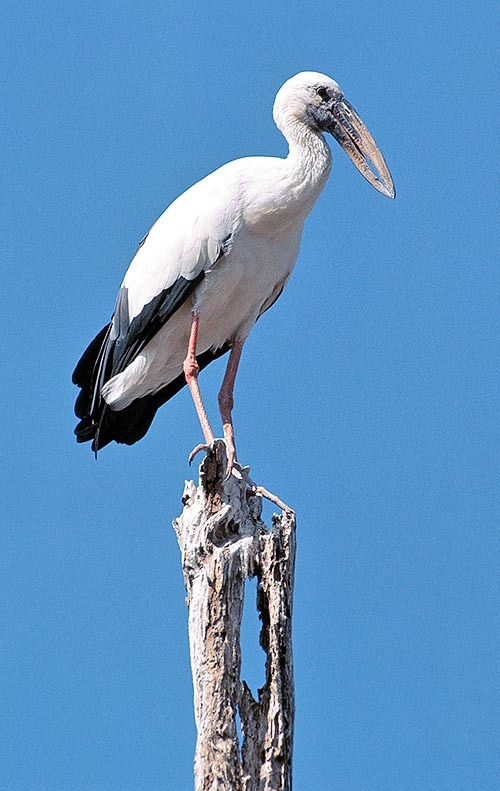 In English, this bird is called Asian openbill; in German, Silberklaffschnabel; in French, Bec-ouvert indien; in Spanish, Picotenaza Asiático; in Italian, Anastomo but also Cicogna becco-aperto or Cicogna dal becco aperto. Uniquely Asian species and practically sedentary, it lives in the Indian sub-continent from the banks of the Indo in Pakistan to south-eastern Asia including the southern part of the Indochinese peninsula up to the Mekong delta. Though considered as sedentary, movements have been noted also of some hundreds of kilometres done in particular by young specimens but also by adults during the various seasonal conditions. In any case, trespassings from such areas have never been reported. It is a very common bird that gathers often in good number in its usual places and therefore its presence is easily remarkable and also its coexistence with the local populations. It is fairly sociable and so it does not fear the contact with the man and its activities. The presence of the Asian openbill is strictly linked to the water therefore this stork frequents flooded plains, paddies, swamps and rivers estuaries with low waters allowing it the practice of its preferred sport: paddle in the water while looking for its choice food. It does not love depths of more than 50 cm, maximum size also for its long legs. This necessity leads it to perform also short movements looking for new flooded locations whenever, due to adverse atmospheric conditions, dryings up of the frequented places do occur. It is an open plain bird and rarely will go up over the 1000 m of altitude. The Asian openbill is a big stork measuring about 80 cm of length, a weight quite variable between 2 and 6 kg and a wingspan of about 150 cm. 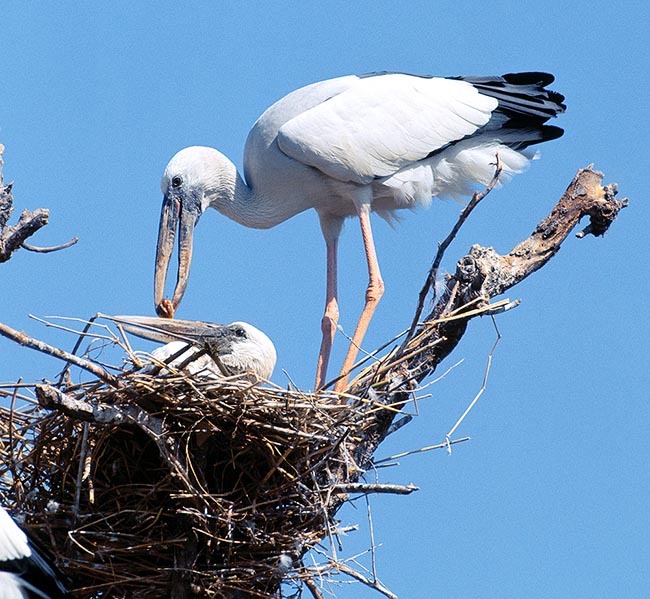 The adult has the white and black colour typical of our storks, with white or pale grey body and black wings, rump and tail black. The white colour maintained during the nuptial period, becomes then greyish during the rest of the year. It has long pinkish tending to red long legs. The beak has very robust jaws, enlarged and little tapered, about 25 cm long and is always greenish yellow in the adults and greyish in the juveniles. There are no dimorphisms in the livery of the adults whilst the young are rather greyish-amber on the head as well as on the chest. The body is robust and heavy and, like all ciconids, during the flight keeps the neck fully stretched. During the warmest hours of the day, it often loves to twirl high in the sky on the thermics, alongwith other flying birds and probably from up there it can get a perfect knowledge of the underlying ground and of the flooded areas where it lives. Often these thermics are rightly exploited during its short movements looking for food. The Asian openbill is typically a stork therefore it is practically silent almost all the year round, except in the time of nidification when it emits short and guttural grunts accompanied by loud and brusque beats of beak. Actually, their vocal cords do not have any musculature. 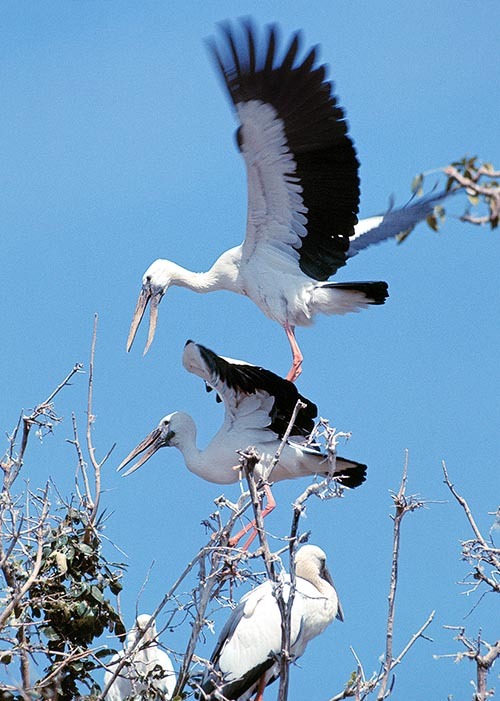 This stork is monotypic as no subspecies have been classified. 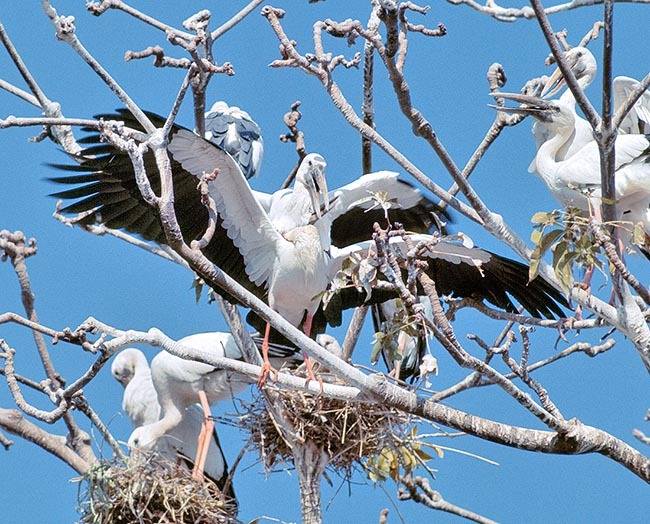 The Asian openbill is much sociable and nests in vast colonies placed on big trees that are often shared with ardeids or other ciconids having in common the need of defence. Often these trees are semi-submerged and located in the middle of swamps or in marshy areas. It is difficult to assist to a single and isolated nidification which unfailingly would mean the predation by some big eagle or other bird of prey. The most common predation is done by flocks of Indian hawks but also by the monitor lizards that often pillage the colony. The union of many pairs and the continuous noise of the beaks of these birds is the best deterrent for any predator. 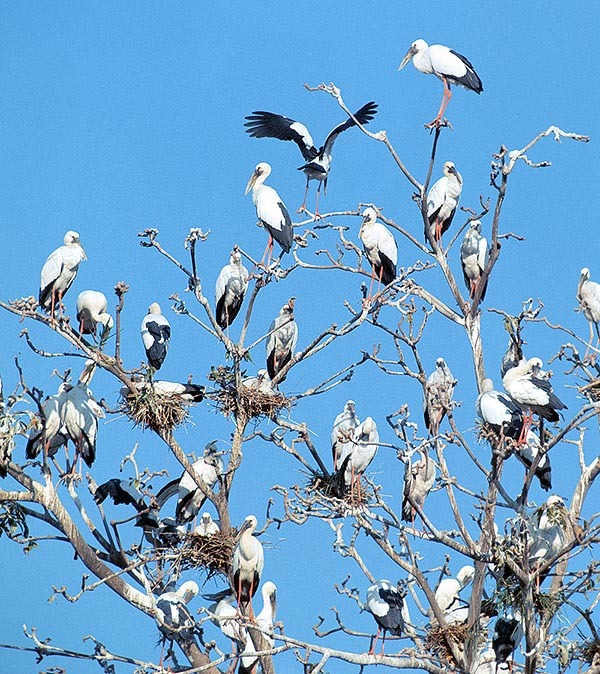 This stork occupies always the upper part of the colony and the nest is built on the upper crown of the tree leaning on the bigger branches and renewed every year to form huge masses of branches and twigs. The nest is usually 100 cm wide and thirty cm deep. The nests are usually placed at a height of 5/20 metres. It is a monogamous species even if have been ascertained cases of polygyny and the pair forms after that the male has built or renewed the nest chosen by the female. It usually nidifies in the rain season thus having guaranteed, close to the area chosen for the nesting, the marshy areas necessary for the collection of food. It usually lays 2 to 5 whitish eggs that are hatched by both parents for about 3 days. The young are rather precocious and fly relatively soon remaining in the nest for about 6 weeks even if the total independence is reached many weeks later. It seems that this precociousness has been confirmd also by the possibility of the young to reproduce even in the same season of the birth. Also their life duration, especially for the specimens in captivity, is remarkable and may easily exceed the fifteen years. Their diet is mainly formed by aquatic snails (genus Pila and Pomacea), frogs, fishes and small aquatic invertebrates. They eat, without any difficulty, also lizards and small snakes. As said before, the conformation of the beak facilitates the seizing of these preys that are firmly held between the jaws withourt having the beak gotten smudgy by the water, the slush or possible weeds that would hinder the grip. The seized snail is then usually shelled by hits of the pointed beak and then swallowed without shell. Often and especially the young, swallow them whole without any precaution. It seems that the space between the two jaws may work also as a nutcracker. The snail of the genus Pomacea is considered as a pest of the rice fields and of the marshy tropical zones and one of the most invasive species of the planet. 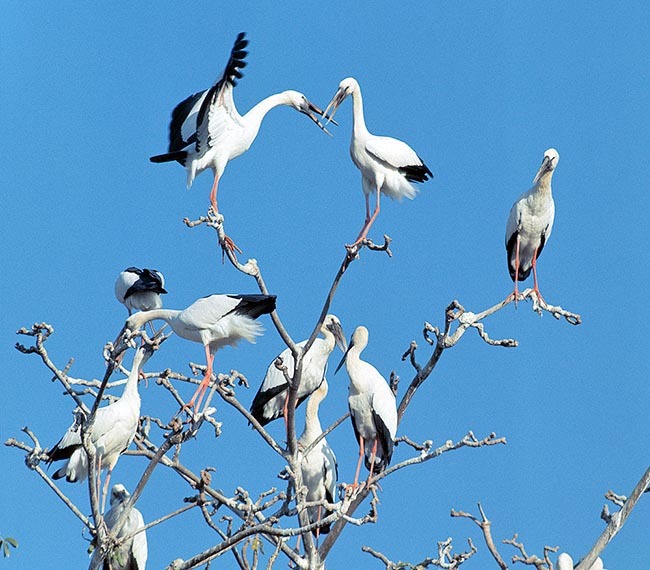 The hunting activity is performed alone but it is not rare to see a huge number of these storks when the frequented location results abundant of food. As is often case for big-sized birds, also the Asian openbill is subject to the poaching. Morever, their flesh is considered as tasty and also the eggs are subject to unlawful takings by the local populations. In any case, this bird is very common and numerous and is able to easily overcome this predation. → To appreciate the biodiversity within CICONIIFORMES please click here.